I like making my own salsa because it can be as hot or as mild as I want it to be simply by adjusting the amount of jalapeno pepper added. It's a pretty simple and straight forward recipe. The only bizarre thing about it is that it looks and tastes different each time I make it. Go figure! 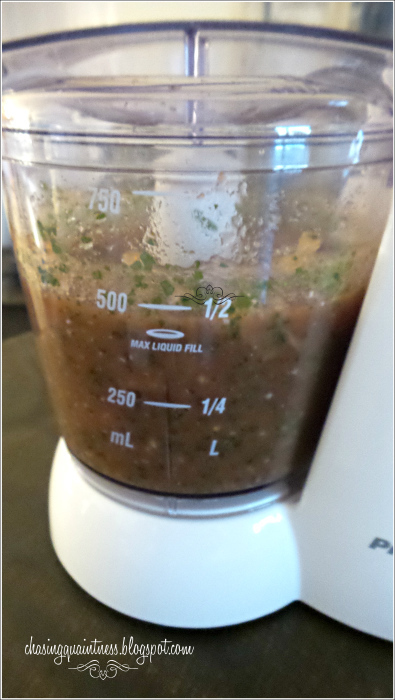 Place all ingredients in a food processor or blender and pulse until the salsa becomes your desired consistency. I prefer salsa less chunky, so I blend the ingredients for a bit. *If you want your salsa sizzlin' hot, add some of the membrane and seeds from the jalapeno pepper. Do this a little at a time and blend. Then taste it to see how hot it is. If you want it very mild, do not add any of the membrane or seeds. Also, if you are allergic to jalapenos like I am, use gloves when handling the pepper. I always add a little more salt, but never go over a teaspoon. We love this salsa. I can't eat very spicy foods, so I keep ours a little on the mild side. But if you can take the heat, then by all means, make it sizzlin'! I normally pair this salsa with a Quinoa and Black Bean recipe, but you can also use it on tilapia, tacos, eggs...anywhere you would normally add a little extra flavor. This time, however, we paired it with Edward's Dang Quesadillas. I'll show you those tomorrow! Your salsa looks great and my hubby would really like it! Thank you ma'am....it is really good and so easy to make! Ok Yum! Salsa is one of my faves especially homemade. I will try this one. I do not like the heat so mild is good for me too. Fingers crossed for good news today. Thank so much Kris! I think you guys will really like it because it’s easy and you can adjust the heat! I sent you an email about the closing! Thank you again so much! You are just a sweetheart!! love me some salsa! especially homemade. i also use it in omelets . . . YUM! it heats instantly. so when you fold over ... with some shredded cheddar ... oh good grief. That's what my hubster does with it....he is in heaven with it! He puts salsa on anything that doesn't move...LOL! Hugs!! 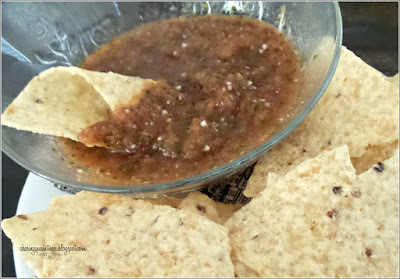 Salsa is a staple in Texas....something that you always have on hand and it is much better when it's homemade! Since the hubster was raised in Texas, he eats it on everything! Hugs!! Thank you ma’am….sometimes it is more greenish in color if I add more cilantro (which I love) and sometimes it is more red, but either color, it is always delicious! We use it on so many things, especially the hubster! He likes it hot, but I have to have it mild! Hugs!! 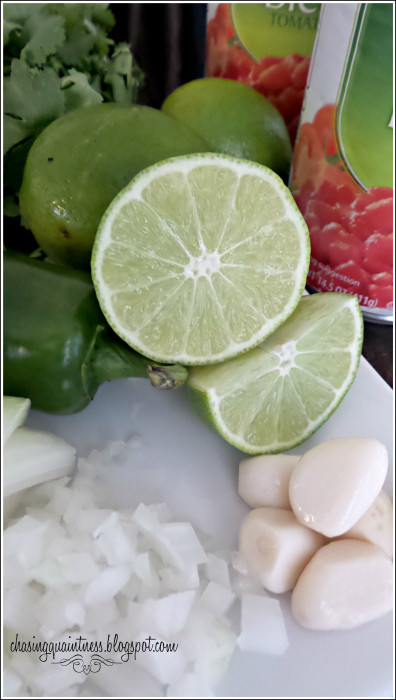 We make a salsa similar to yours with red onion and no sugar. But for me, the cilantro is what makes it...it's my human version of catnip. Seriously, I love the stuff! And I say you're getting your vitamins, minerals, and fiber in this dish, so it's all good! I've never made salsa. I don't suppose you could come cook for me, could you. I am not at all creative in the kitchen. 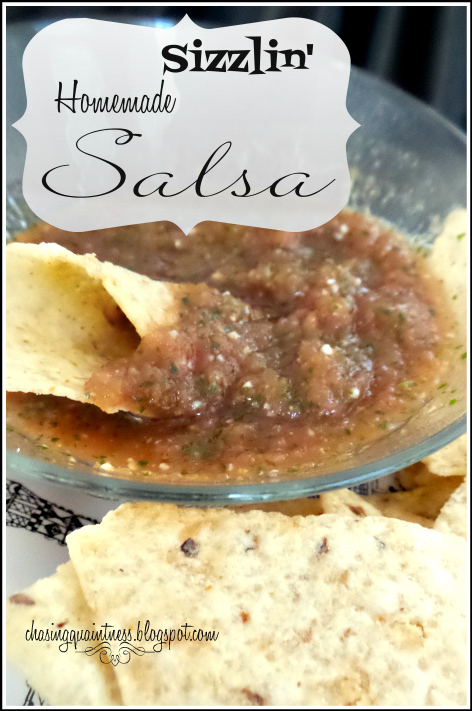 I love salsa and always thought of it as healthy eating! It is really low in fat anyways! I have never made my own salsa....I cheat and buy picante! I couldn't use any of the jalapeno's but it sounds easy enough to try! Yeah, I have a thing for tortilla chips so that is dangerous! I tell myself that if I buy the blue tortilla chips then it adds to the “healthy” factor. :-) I would think you could make this without the jalapenos and maybe use a sweet pepper or something. Or maybe a bell pepper to give it a little bit different flavor. This looks amazing! Different from the salsa recipe I use, I will have to try yours! Can't wait to see your Quesadilla recipe too! I hope your closing went through!!! Thank you so much Kimberley....it does taste wonderful. Just tweak it and make it your own! Our blender is packed in a box somewhere in the land of moving...LOL. The quesadillas post will be later this week, unfortunately. Closing was a total nightmare and I'm still so upset...it was just awful! My post today explains. I hope to be able to get the quesadillas up tomorrow or Friday. I have never used the food processor to blend the salsa. Mine is typically chunky, but I'd love to try your recipe soon. it would make a great snack! This looks so good. Can't wait to give it a try and it doesn't look like it will take a lot of time. Thanks for sharing at Friday Favorites link party.